After Uday's Lamborghini got blown up, you might think that all the interesting cars were gone from Baghdad by now, with just Ford Probes remaining to hold the gearhead banner over the ancient city. Not so! Turbo Driver (aka The Wolf) has some sort of secret-type gig in Iraq and snapped these shots of an underground parking garage just packed with old Cadillacs, Rolls-Royces, and Mercedes-Benzes (plus what appears to be a Breezeway-equipped early-60s Mercury, among other things). We also get some bonus shots of military Land Rovers in the Green Zone. Who can identify all the vehicles in these photos? Make the jump to read The Wolf's description and see the entire gallery! These are various cars found by the Coalition in downtown Baghdad. An accounting office from DoD was sent in to 'inventory' these and I was invited along as a resident gear head. They were reported to us by an 'informant' who detailed where they were. Several levels under ground, they had been there for some time and not used at all in years. Several of the newer ones were wrecked. We could never figure out why several were even notable enough to keep around. See how many you recognize! Lots of Rolls and Caddy's. A few Benzes. 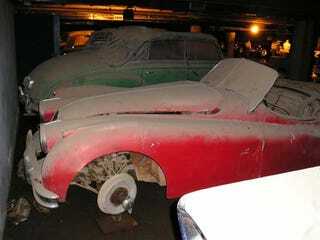 One ESPECIALLY interesting one- near as I can tell, its some 1936 MB 500 K or some sort. The sign in front was in Arabic, and couldn't tell if it really went to this car or not. All I could find out is that something like 3 were built, all wheels were fully enclosed/skirted, it was dirty but otherwise in great shape, given the environment it has withstood. I doubt it had been moved in over a decade. Also surprising was there was no sign of rat-infestation on most of these. It was chilling to look at. Had I had half a chance to get one thing outta there, this would have been my first choice. Ok, these were parked outside the CPIC (coalition press info center) just inside the green zone. not sure if they were Aussie- or Brit-held vehicles; both groups drove Rovers (although from the flag on some, Brit is a first guess). All I know is, I've NEVER seen the little LR with a snorkel before, and never an armored version like these. I've ridden several times in a SLIGHTLY armored version; that was far different from our Hummers. These must have been like ovens. The armored version I was in was SLOW- these must have had speedo's measuring tenths of a mile per hour... but they were built like vaults. Now, if i could only find the pics of the Norton that was buzzing around the green zone- it was old and gorgeous. VERY well kept.